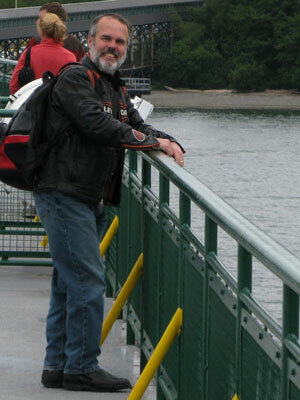 Bill Branley came up with the idea for his first novel Sea Changes (2006) while commuting on the ferry from Bainbridge Island to Seattle. It is therefore no suprise that the book's opening line goes as follows: "Peggy Heggy boarded the morning ferry to Seattle just before 5:20 and walked along the corridor to her favorite seat." There, Peggy, a widow in her 50s, ends up meeting a widower and a relationship begins. While the two disagree on all issues of the day - from global warming to homeland security to Hurricane Katrina - their commitment to each other deepens as life takes them from Washington State to Maine and then to New Orleans. Sea Changes earned an Honorable Mention in the ForeWord Magazine 2006 Book of the Year Awards. In addition to Sea Changes, Bill Branley writes short stories which have been published in various magazines, including the speculative fiction anthology Obliquity. He is also currently writing a fiction blog with the title Night Watch. For more of Bill Branley's writings go to http://www.billbranley.com/.